Can I suggest or recommend projects to Patriots Ghana? Yes, if you have identified a pressing development need in any community within Ghana, feel free to email is with detailed information or facts. Patriot’s team would do a follow up with any of Team members who are close to the particular area or community that need our help. If you are a Patriotic Ghanaian leader who is in one way or the other has made an impact on Ghana’s development or growth or passionate about Ghana’s development and have the passion to serve as a Board member, you can write an email to team@patriotsghana.org to explain your request and Background. The team would access your background to see how you can best support the vision and also if your request can be accepted by the team by resolution. Can I Follow up on Emails not replied? Can I send materials for donation? Can I donate money towards a particular project or Cause? Yes! If there is a cause that you are passionate about, we can make sure your funds go to this cause. 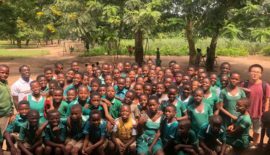 For example, if you want to sponsor one child for a year, or if you want to buy a certain number of soccer balls (footballs) for a school, we can arrange that. You are also welcome to donate to our general fund. We assure you that your donation will be put to good use. To make a financial donation kindly contact us to provide you patriots account details of the project you want to support. 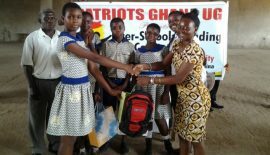 How can my organization partner with Patriots Ghana? Who qualifies to be a member of the Patriots Ghana? Basically, any Ghanaian both home and abroad, who is 18years and above qualifies to be a member of the Patriots. However, it is not a Guarantee to be accepted as a member is you meet the basic requirement. The team has the right to access your background before acceptance. How Can I become a member of the Patriots Ghana? To become a member of the Patriots, kindly complete an online application form at the Membership under the ABOUT US page. After receipt of the application form, a team member would contact you regarding all other processes and information that might be required to be accepted as a member.